The King is Dead, Long Live the… Wait, is it Good for the Jews? “Is it Good for the Jews?” is a generations-old criterion for making sense of world events. Wars, revolutions, natural disasters, something colossal has happened, at the bottom line we want to know the only thing that matters – is it, or is it not? 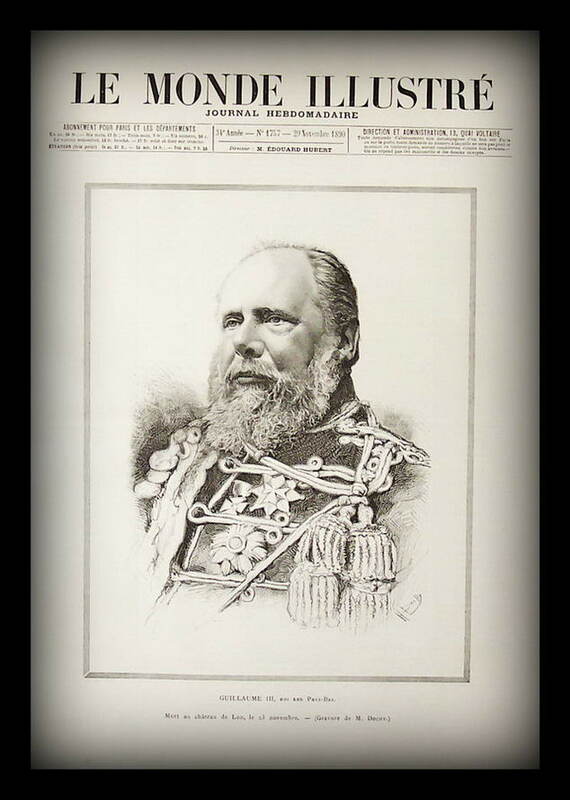 For the occasion of the abdication of Dutch Queen Beatrix and the inauguration of her son Willem-Alexander, I translated with the help of my friend David Nortman a 1890 article from Ha-Melitz reporting the death of King Willem III of the Netherlands. I found this article randomly while looking for materials on the Jewish migration overseas, and thought that it was worth presenting as a pure demonstration of this analytic tool in action, a hilarious combination of cosmopolitanism and provincialism. It reads as “The King is Dead, Long live the… Wait, is it Good for the Jews?”. Ha-Melitz (1860-1903), the first and one of the most important Hebrew newspapers in Imperial Russia, was a venue addressed to a relatively wide audience of Maskilic (of the Haskalah, the Jewish enlightenment movement) Jews. It published literary works by the greatest Hebrew writers of the time, as well as local and world news. The article published on December 1 (Nov. 19 [o.s.]) 1890, about a week after the death of King Willem III, starts with grievances over the loss of the monarch, heavily relying on biblical phrases, mainly from the book of Lamentations, typical for similar notes on the occasions of the death of rabbis and other prominent Jews. Soon it goes to describe the tolerant attitude of the King towards the Jews of the Netherlands, whom during his days were emancipated and protected from the rising tide of modern antisemitism. It ends with expression of fears of an unknown future in regards to the prospects of the surfacing of popular antisemitism in the Netherlands. In other words, King Willem III was good for the Jews; the King’s death is bad for the Jews. Anything beyond this scope appears to bear no significance whatsoever and is therefore ignored. The use of biblical quotations seems archaic and hyperbole for contemporary readers of Hebrew newspapers. But following the contexts from which these quotations are drawn, which would have been natural for the common maskilic reader raised within the traditional Jewish education system of kheder and talmud-torah, adds significant layers of meaning to the text. 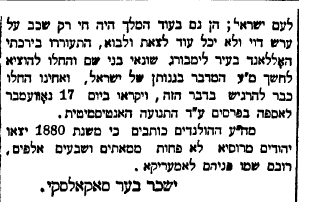 For example, to describe the dying days of the King, the article uses the phrase “ולא יכל לצאת ולבוא” (could no more go out and come in), which literally describes the physical condition of restricted mobility. But as readers of the text would know, this quotation is drawn from the chapter describing the dying days of Moses, by that adding the sense of likening King Willem III to the greatest of all Jewish leaders. To describe the fear of the coming out of popular antisemitic sentiments, the article uses a quotation from the book of Proverbs in the sentence “מי יודע אם לא יצאו עתה חוצץ כולם” (who knows whether they will not go forth all of them by bands). Literally it describes the prospects of masses coming out as a movement, but the reader would have remembered the beginning of the phrase from which this quotation is drawn: “מלך אין לארבה, ויצא חצץ כולו” (The locustes haue no king, yet goe they forth all of them by bands). Knowing the textual context, the reader understands that this is not just about masses coming out, but about leaderless, or even more specifically, kingless, masses coming out, highlighting the significance of the King’s death in regards to the possibility of the emergence of popular antisemitism. Wherever I could spot an obvious biblical quotation, often with some changes of words, I added the source in brackets according to King James Bible, and relied on it for translation. Towards the end of the article, an antisemitic newspaper is said to be “put out into the darkness”. This is a Hebrew antiphrasis, a commonly used rhetorical tool in Jewish writing and folklore. It is based on a reversal of the Hebrew term “להוציא לאור”, literally “to put out into the light”, meaning to issue a printed publication. I kept the literal meaning in the translation. 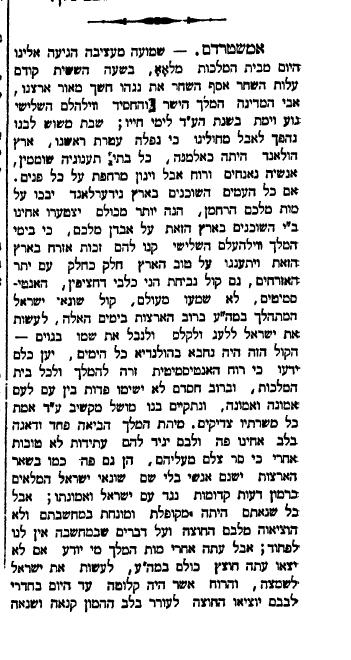 The article was written by Issachar Ber Sokolsky, in brief searches I was unable to find further details on him, except that he also published in the Warsaw-based Hebrew daily newspaper Ha-Tsefirah. We received sad news today from the royal palace at Het Loo, at the sixth hour before dawn, dawn withdrew his shining [Joel 3:15] and the light of our land has faded, father of land the honest and righteous King Willem III, has passed away, dying in the seventy-fourth year of his life; the joy of our heart is ceased, our dance is turned into mourning, for the crown is fallen from our head [Lamentations 5:15], the land of Holland has become as a widow [Lamentations 1:1], her houses of pleasure are desolate, her people sigh [Lamentations 1:4] and the spirit of grief and sorrow moves upon all faces [Genesis 1:2]. Though all nations dwelling in the Netherlands cry over the death of their merciful King, more than all grieve our brethren, the sons of Israel living in this country, for the loss of their King, for in the days of King Willem III they acquired the rights of citizenship in that country and they have enjoyed the good of the land [Ezra 9:12] like portions [Deutronomy 18:8] along with the rest of the citizens, nor have they ever heard the sound of the barking of rude dogs, the anti-Semites, the voice of the haters of Israel heard about in most countries these days, making Israel a scorn and a derision [Psalms 44:13 and 79:4], slandering its name among the nations – this voice has always been absent in Holland, for it was known to all that the anti-Semitic spirit is foreign to the King and to the entire royal house, and in their grace they put no division between people and people, nor between faith and faith [Exodus 8:23], and they were as a ruler who hearkens to truth, whose all servants are righteous [Proverbs 29:12]. The King’s death has brought fear and trepidation to the hearts of our brethren here, and their hearts foretold them bad omens after their defence is departed from them [Numbers 14:9], for here too as in other countries there are nameless people, haters of Israel, who as a pomegranate are filled with prejudice against the people of Israel and its faith; but all their hate has been wrapped up and concealed in their thought and they did not let it out of their hearts, and we should not worry for matters that are in thought alone; but now after the King’s death who knows whether they will not go forth all of them by bands [Proverbs 30:27] to defame Israel, and whether they will not bring out the spirit that was hidden in their hearts until today to arouse hatred and envy among the multitude against the people of Israel; for already as the King was lay on his deathbed and could no more go out and come in [Deuteronomy 31:2], there arose in the remote regions of Holland, in the city [province] of Limburg, the haters of the sons of Shem, and began to put out into the darkness [light] a newspaper defaming Israel, and our brethren have already begun to sense the effects of this, and called on the seventeenth of November for an assembly [unclear] the anti-Semitic movement. Yes, I remember you told me of it… still on the to-read list! If your great-grandfather arrived through Ellis-Island, and you know the approximate date of arrival or the name of the ship, and the name he would have used, I would first try looking him up on the Ellis-Island records using Steve Morse’s search form (stevemorse.org/ellis2/ellisgold.html). If he arrived through another port of entry, try to find him on ancestry.com. To find records from the old country you’d first have to identify his town of origin. In 1898 it wasn’t yet a common practice to record the last place of residence on the ship manifests, so what I would do is to try and find arrival records of his close relatives who arrived a few years later, since 1900 or so this information was more frequently recorded. Also, if his family name was rare, you could narrow down the options by looking up the towns from which other immigrants with similar family names arrived. Alternatively, if he lived in New-York, you could try to identify his town of origin if he was a member of a landsmanshaft (hometown-based association). Try to find his burial plot, it is not unlikely that he was buried in a plot that belonged to his landsmanshaft. For more details, see here: http://www.jgsny.org/ny-landsmanshaftn-a-other-jewish-orgs. The 1897 census does have a few micro-data left, but indeed only for a few restricted areas. However, there are many other collection of Jewish records from Imperial Russia, millions and millions, and they are becoming increasingly available online. Once you know the town of origin, look it up on jewishgen.org. Thanks very much for the resources Yannay. I did find out he was from Grodno, and that Ellis Island was out of commission due to a fire when he came through New York. He went to Phillipsburg, Pa. to join a brother who had immigrated two years earlier. I will see if I can find the ship manifest, and figure out the likely route he took to America. From what I am learning, he would have been 9 years old when Czar Alexander the second was assassinated, and then things got even worse for the Jews, with the pogroms of 1881-82 and the subsequent May Laws. If you want to read more about it, I strongly recommend looking at John Kiler’s book, Imperial Russia’s Jewish Question: 1855 – 1881 (http://books.google.com/books?id=iFR2QgAACAAJ). Thank you so much Yannay. I will definitely check out all of the sources you mentioned. http://economics.stanford.edu/files/Spitzer5_1.pdf. It include a map of the 1881 pogroms, and you’ll see that Grodno province had nothing going on. I will be posting more information about that soon. Your interpretation is correct, about 1 in 400 Jewish workers were employed in production of spirituous liquors, but add to that 0.84% (1 in 120) dealers in spirituous liquors, and possibly some of the 0.7% “hotel and restaurant keepers”, many of which were tavern keepers. So in spite of the restrictions, Jewish employment in the alcohol sector was significant. I am not certain about the details, but I do not think that the ban was absolute. The restrictive policies mainly applied to the countryside, and the workers of this sector in 1897 may not have been illegal. Moreover, during the reign of Alexander II, special provisions were given to Jewish distillers to settle outside the Pale of Settlement and produce alcohol there (Klier speaks of that in his book). Alcohol was the single most important source of revenue for the Russian government, accounting for more than 20% of the government income as late as the first decade of the 20th century. As much as they wanted to crack down on Jewish employment in this sector, they always had the interest to keep it going and to expand it. Your are welcome, good luck in your searches!